Sometimes, your own distrust attacks you with all kinds of arguments. Fight back! Yeah, we’ve made mistakes in our past. Yeah, we’d like to not be the “kind of person” to make those mistakes again. We’d be very glad to be past it. But of course, how will we know that we won’t? How will we know that, when the time comes, we’ll make the right choices, if we’ve made the wrong ones in the past? The thing is, you have intentions – those intentions are what cause you to act as you do. Now let’s say you’ve had an intention in the past that was “to make so and so’s life terrible”, and now, looking back, you don’t like that intention of yours. How can you live peacefully, knowing you once, impulsively, made that your intention and acted upon it? Latest thing I learned from my self-training: That just because you make decisions toward one end doesn’t mean you need to fear its opposite. All it means is that you respect yourself enough to lead yourself towards a prosperous future. This may seem like a small distinction, but it means the difference between constantly running away from something and being at peace with wherever you end up. That is, you can face whatever comes your way, while at the same time guiding yourself toward something positive. After all, no matter how much information you gather for your decisions, there will always be uncertainties in the outcome. Today I found that the key reason why I can feel self-doubt is because the part of me that makes decisions has hidden conflicts with the absolutely confident (and for the “right” reasons only, he might add) part of myself. This inner warrior draws a hard line and does what he thinks is right at all time, no matter how tough or what he has to go through (at least that’s how he tries to live). So the playful side of myself occasionally gets on his nerves. 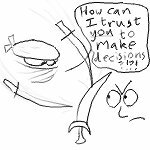 When there’s a lack of trust between the inner decision maker and the inner warrior, then I feel separate from my confidence. But when we’re going the same direction, we are unstoppable. Ok, maybe still stoppable, but we’re getting there.